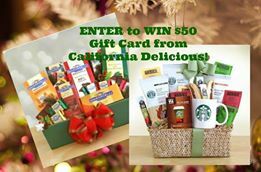 California Delicious Giveaway — MumbleBee Inc MumbleBee Inc.
California Delicious is giving one lucky winner a $50 gift card to California Baskets! Enter to win in the Giveaway tools below. Disclosure: I did not receive any monetary compensation for this post. No purchase is necessary to enter. Void wDisclaimer: The participating bloggers were not compensated for this post. We are not associated with any of the companies named above. No purchase is necessary to enter. Void where prohibited by law. The odds of winning are based on the number of entries received Open WORLDWIDE but prize must be sent to US physical address. Confirmed Winner(s) (by Random.org) will be contacted by email. Winner(s) have 24 hours to respond before a new winner is chosen. No purchase necessary. Void where prohibited by law. MumbleBeeInc is not responsible for product shipment/delivery. This event is in no way administered, sponsored, or endorsed by, or associated with, Facebook and/or Twitter, Google, Pinterest. This disclosure is done in accordance with the Federal Trade Commission 10 CFR, Part 255 Guides Concerning the Use of Endorsements and Testimonials in Advertising.here prohibited by law. The odds of winning are based on the number of entries received. The California Fruit and Cheese Gift Tower is the one I would pick it is sure to make anyone happy. i love the wente chardonnay holiday gift tray! I would use the gift card to buy a Best of America’s Snacks Gift basket. I like the meat and cheese gift!